If there were 5 things I would advise for spring as wardrobe staples, this outfit pretty much sums it all up. 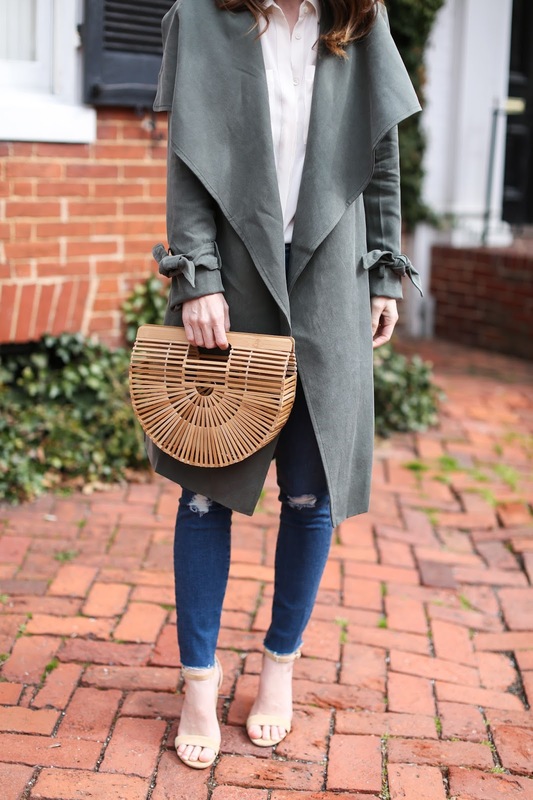 A trench coat (either in classic tan or a fun shade like blush or green), a silk button down blouse, a good pair of jeans, simple sandals (either high heeled or flat) and a fun handbag. It can be easy to get distracted by all the fun off-the-shoulder tops and flowy dresses for spring and summer, but having pieces like this in one's closet is a much better investment. Scroll down below to see a bunch of great options at all price points in each category - press the arrow to the right of the widget to see more pieces. I love that coat. Would you say it is an oversized fit/cut? Yes, I bought the smallest size.